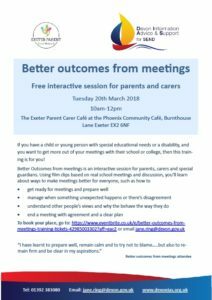 School and college meetings are a part of everyday life if your child has special educational needs or a disability. Good meetings give you a clear sense of your child’s needs, support and progress and leave you feeling positive, listened too and understood. But sometimes meetings don’t go as well as they could. As a parent you might find them challenging and stressful, or feel out of your depth or confused. If you’ve ever wanted to get more out of the meetings you have, or want to feel empowered and positive about them, then this training is for you! Friday 23rd March 12.45– 2.45 at St Leonard’s Primary School, Exeter. To book your place, click the link above for the session you want.